This poorly maintained air dryer operated for many years even though it had no load. This manufacturer historically had a great deal of difficulty keeping their air compressors and air dryers running. Typically, after a number of compressed air system shutdowns were experienced the compressed air service provider would get the blame and be fired only to be replaced with a new firm. This had continued over the years, with each local vendor trying numerous solutions to attempt to keep the system running. Each competing vendor rarely communicated any maintenance history to the other. After attending a Compressed Air Challenge® seminar the maintenance staff at this foundry decided to hire a compressed air auditor to look into their system and suggest solutions. The audit discovered poor compressor control, poor operating conditions and high system waste were costing this manufacturer thousands of dollars per year in wasted energy and maintenance. What follows is a general description of what was found and what was done to improve the system. The ambient conditions in this factory were terrible for air compressors. A layer of soot and metal dust deposits was on anything stationary, quickly turning the cleanest of new equipment to shades of black. Since large electric arc furnaces are used to melt steel for the product, the heat expelled raises the building temperature in some areas to very high levels, even on cold winter days. Since the dust was everywhere, formed by the vapors rising from the molten metal being poured into molds, and generated by the grinding operations, any air cooled equipment cooling surfaces would be quickly clogged. Because of this, the air compressors and dryers were liquid cooled. Unfortunately, the cooling water used for this equipment was also used to cool other processes and was full of contaminants. This manufacturer had a system of four 150 hp water-cooled lubricated rotary screw compressors grouped in two separate compressor areas, which were separated by about 600 feet. These compressors were operating in modulation control mode, partly due to the poor condition of the units, and partly because it was difficult to coordinate any other type of control across the plant and the significant pressure differential across the filters and dryers. This system used water-cooled non-cycling refrigerated dryers experiencing shutdowns due to water contamination and high inlet temperatures. The system was consuming slightly over 4 million kWh while producing about 2,000 average cfm flow. The system specific power was about 26 kW per 100 cfm. Plant flows on weekends, with no production running, consumed enough air where two compressors were required to run to maintain pressure. The operating costs for the system were estimated at $202,000 per year when all the compressors were running. Unfortunately, as the system compressors started failing, a bank of diesel rentals had to be brought in to assist, greatly increasing the costs due to rental and fuel consumption. The air compressors were running in an inefficient modulating mode allowing the compressors to be adjusted so they shared the load. When the units all ran at partial loading, less heat was generated by the compressors. Since the compressor cooling water was poor the internal tubes of the heat exchangers were partially blocked by debris. Less heat meant less chance of tripping the compressor off on over-temperature. Drains were installed on compressor controls that rendered the sensing circuit blind causing dangerously high pressures at low loads. Over the years various control schemes were attempted to try to coordinate the operation of the compressors and improve pressure control, including moving the pressure sensing downstream of the dryers and filters, and installing special pilot actuators which reduced the compressor operating pressure band from the standard 10 psi to a narrower 3 psi. This scheme failed, resulting in motor losses and confusion because as service providers were hired and fired, each new set of technicians did not know what the other had done previously. Finally one ill advised method was installing drain valves on the pneumatic circuit feeding the modulation valve actuator, a diaphragm operated device that mechanically opens or closes the compressor inlet valve. Plant personnel would manually operate these valves to dump air out of the pneumatic circuit causing the inlet valve to open more or less. They used this manual method to try to balance the compressor loading. Unfortunately this change swamped the inlet control circuit and caused the compressors to operate blind, when the plant load dropped, pressure levels would rise to dangerous levels. One compressed air parts supplier tells a story of the plant production personnel coming to them asking for mufflers to attempt to quiet the receiver tank safety blow-off valves because they were too loud and distracting! Due to poor maintenance practices, and extreme ambient conditions, various items on the compressors started to fail as they aged. Two items that cause a reduction in capacity that tipped the scales for this customer were blow-down valves that failed in the open position, robbing the plant of the compressor’s full capacity, and an improperly installed inlet valve. After one compressor had been replaced, it was discovered that someone had installed the inlet valve improperly after a rebuild, preventing it from opening fully and thereby blocking this compressor from adding much capacity into the system, even with the manual control. These items made it impossible to maintain normal plant pressure without diesel backup capacity. After struggling with the system for over a year, permission was finally granted by head office to start making improvements to the system. The economic situation for this customer wasn’t the brightest at the time of decision and management looked for ways to get some kind of external assistance to help pay for the equipment purchases. Fortunately they had a power utility granting incentives for power savings. Simply replacing the compressors didn’t generate enough incentive to allow the project to proceed, so other items needed to be addressed to increase the energy savings. A compressed air audit identified a number of items that could be improved on the demand side of the system. The primary one was plant compressed air leakage. The plant had a flow of over 1000 cfm even when there was no production. A focused leak management effort was able to achieve a significant impact on this flow. During leak reduction activities a large unnoticed leak on a bag house manifold up in the roof area of the plant was found. This reduced the flow by an estimated 550 cfm. Other items such as compressed air powered cabinet coolers were used extensively in the plant as well as ring jets to promote the flow of vapors up exhaust ducts. These items were converted to more efficient methods and/or controlled so they did not run during times where they were not required. 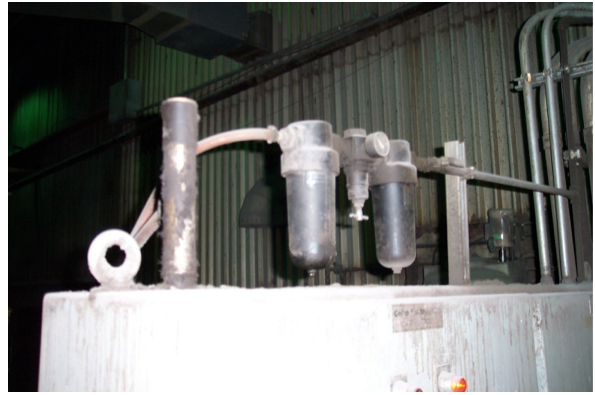 One heatless desiccant dryer was found purging continuously. This type of dryer was required to protect bag houses that were located outdoors to prevent freezing in extremely low temperatures. This is acceptable, but the bag house the dryer was installed to protect had been removed 5 years earlier, the dryer had never been decommissioned. The reduction of end uses and leakage was enough to generate the level of funding necessary to initiate the project, which involved almost completely gutting the compressed air system. Three of the four compressors were replaced with new water-cooled, two-stage lubricated air compressors. The units were purchased with extra large coolers to reduce the effect of dirty cooling water. One compressor purchased was a VSD controlled unit designed for partial load. This was installed in an area of the plant less susceptible to dust contamination and high temperatures. The compressors were connected to a new master compressor control system that orchestrates the operation of the compressors within a single narrow pressure band. Pressure is sensed at each end of the plant and compressors are turned on and off to maintain the average pressure between the two ends. This controller is also outfitted with a remote monitoring system allowing plant management to monitor the efficiency of the system and the status of the compressors from any plant computer. Water-cooled compressed air dryers were purchased using cycling style control and the filters were arranged resulting in low pressure differential. End use reduction and leakage repair reduced the average flow substantially. Verified energy savings were measured at 1.8 million kWh for a 42% reduction resulting in an operating cost saving of $85,000 per year. System specific power fell to 17 kW/100 cfm due to excellent compressor control. With the utility incentive the project simple payback worked to 2.9 years based on electricity savings alone. If rental air compressor costs were included, the payback was substantially lower. The plant was obviously having problems than needed attention, but it took a compressed air system audit to come up with a list of issues to improve. Because an audit was done, plant management received documentation of their baseline energy consumption, and a list of potential improvements that could be used to apply for external energy efficiency funding. As a result, the project was implemented and the system greatly improved, not only increasing the reliability and pressure stability, but also reducing the cost of operation. To read more Air Compressor System Assessment articles, visit www.airbestpractices.com/system-assessments.